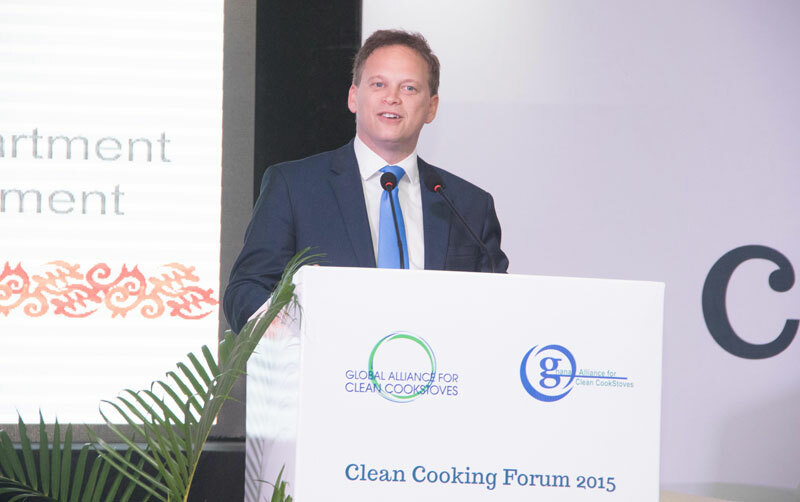 Grant Shapps, Minister of State, UK Department for International Development, delivers the keynote address at Day Three of the Clean Cooking Forum 2015. 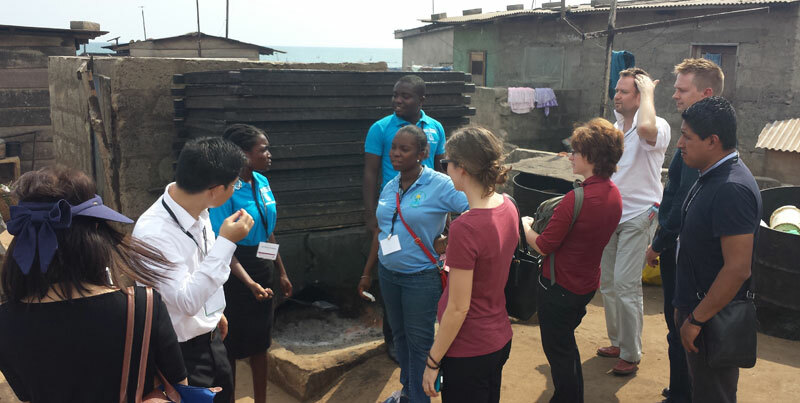 Day Three of the Clean Cooking Forum 2015 offered attendees a tremendous range of opportunities to learn about global activities at the ministerial level, and also see first-hand the issues people are facing daily through site visits to select locations in the greater Accra area. The day began with a powerful opening plenary featuring Grant Shapps, Minister of State at the UK Department for International Development, and continued with diverse speakers from nine countries and four continents, with representation that included a traditional chief, business executives, and major governments. This panel highlighted how integrating clean cookstoves and fuels into related sectors can deliver mutual benefits in the areas of health, gender, livelihoods, and the environment. Speakers discussed how clean and efficient cooking aligns with their agenda, and remarked on the ways the private sector needs to be involved, why energy access to all is critical in the developing world, and how clean cooking plays a part in the upcoming global climate discussions that will begin in Paris at the end of the month. Speakers at the plenary (l to r): Wanjira Mathaai, Director, wPOWER hub at the Wangari Maathai Institute; François Pujolas, Ambassador of France to Ghana; Ms. Nana Kofi Abuna V, Chief and Queen Mother of Essipon Traditional Area; Wanjiku Manyara, General Manager, Petroleum Institute of East Africa; Keynote speaker Grant Shapps, Minister of State, UK Department for International Development (DfID); Radha Muthiah, Chief Executive Officer, Global Alliance for Clean Cookstoves; Juan Carlos Paiz, Co-Founder and President, Pani-Fresh, Guatemala; Md. Tajul Islam, MP, Energy and Mineral Resources, Bangladesh; Fei Wang, Director of the Rural Energy and Environment Agency, Ministry of Agriculture, China. Sessions today were limited due to site visits. In the early morning, the author of the Alliance’s Empowered Entrepreneur Handbook, Dr. Anita Shankar from Johns Hopkins University, provided an overview of the Alliance’s training tool and shared evidence from the field on how this training has led to increased business effectiveness and empowerment for women entrepreneurs.  Partners from countries all over the world have begun implementing this training program and are working with women entrepreneurs from Bangladesh, Kenya, India, Myanmar, Bolivia, Uganda, Haiti and more. Hundreds of Forum attendees signed up for one of nine different choices for site visits, a big highlight of the week for many. A fleet of buses ferried the travelers to locations in and around Accra on Day Three to visit a wide range of sites related to cooking. Choices ranged from touring a cookstove manufacturing center to observing coastal residents cooking fish on traditional stoves to visiting a fuel processing site. Participants engaged with women who cook for a school feeding program and who provide an opportunity to observe the problems associated with traditional cooking and the solutions in a rural setting. 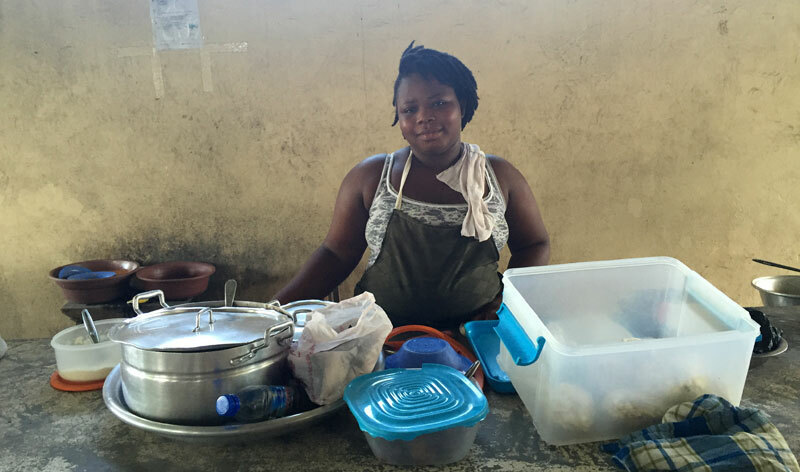 Above, Joyce is one of the many women who cook at the Kodiable School. In the coastal town of Chorkor, residents use traditional and improved cookstoves to cook fish. Attendees above witness the socioeconomic conditions faced by women and men whose homes, incomes, and health are impacted by use of open fires or traditional stoves for cooking and smoking fish to sell in local markets. The Forum Cookstove and Fuels Exhibition opened as the buses returned from the site visits. 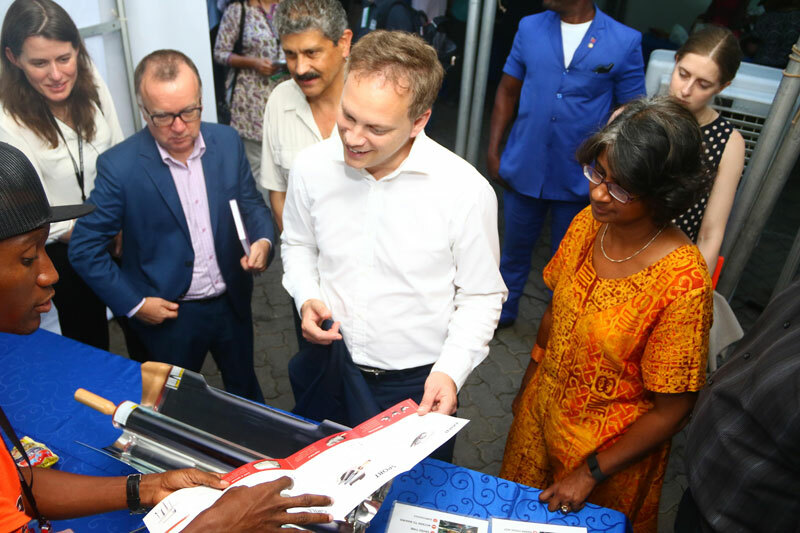 A parking area was transformed into an exhibit space packed with displays, and attendees were able to see the latest technologies from a wide array of manufacturers of household and commercial cookstoves, fuel suppliers, humanitarian organizations, and development agencies. Minister Grant Shapps and Alliance CEO joined hundreds of visitors exploring the many exhibition booths. 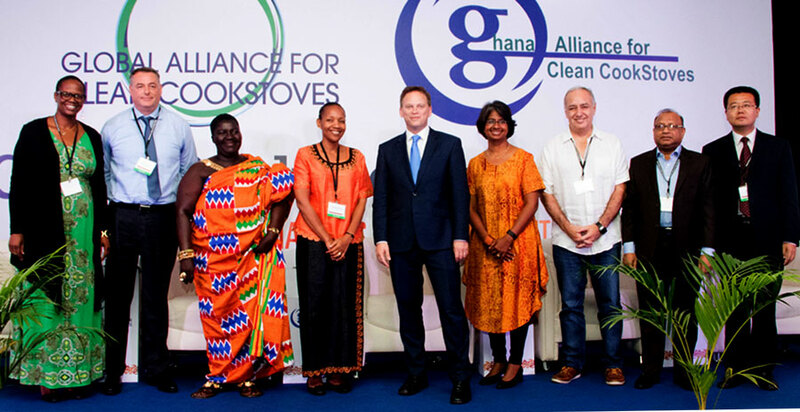 Grant Shapps, Minister of State, UK Department for International Development, and Radha Muthiah, Chief Executive Officer, Global Alliance for Clean Cookstoves. Meeting of the Ghana Girl Guides, members of Parliament, and Alliance staff at the successful conclusion of the day’s special program. As part of the Forum, the Global Alliance invited an inspirational group of Ghana Girl Guides from across the country to Accra to encourage government leaders, including the Minister of Gender, Children, and Social Protection, to support efforts to scale access to clean cookstoves and fuels. The Girl Guides aim to become clean energy leaders in their communities.